Lava X28+ is a budget Smartphone with basic features it has 5.5 inches size 720p HD IPS screen. It is 4G Dual Micro Sim handset powered with Quadcore 1.3Ghz Spreadtrum Processor with 1GB RAM & 8GB Internal Storage. It runs on Android OS Marshmallow v.6.0. It equips 8Megapixel Primary Camera with Face beauty, Slow Motion, Time-lapse Video recording feature and 5 Megapixel Selfie Camera on front, both cameras sport a LED flash. For storage it has 8GB internal with 32GB expandable memory. It has BT, WiFi & FM but OTG support is not given in it. It packs 2600mAh Lithium Ion Battery in it. It is available in two colors Space Grey and Gold. 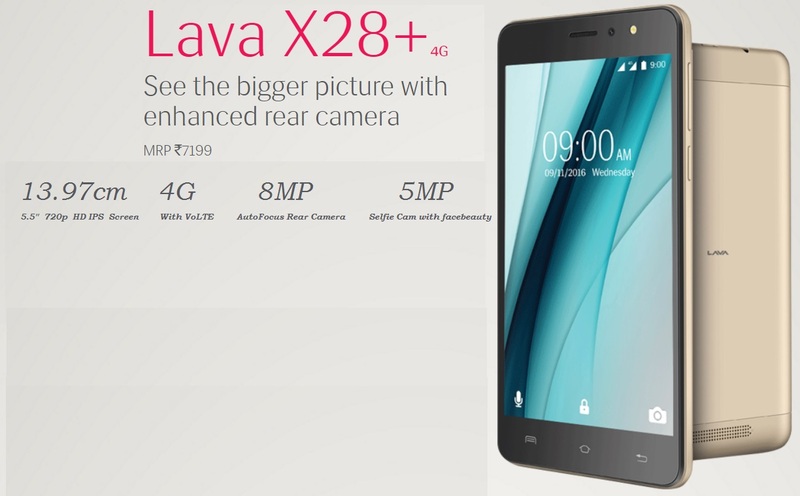 Lava X28+ is priced @ Rs.6559/- on sale online and offline market.